Dana DeMaster, MPP, is a program evaluator and researcher for human services programs who lives and bikes in Saint Paul, MN. The following essay by Dana is republished from Streets.MN with permission. When I was in school as a child, I took the bus. Nearly everyone I knew took the bus or walked. Now, my children are in the very small minority of kids who walk or bike to school. Many children are still bused to school, but my memories of 1985 do not include a long line of cars dropping off children every day. Today, however, more families drive their kids to school than use any other form of transportation. 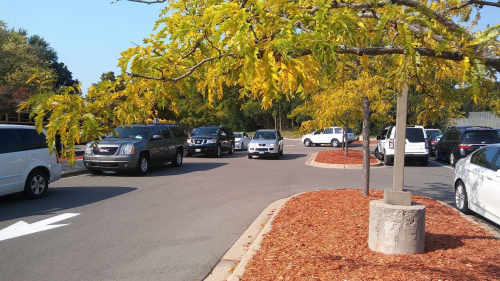 The maze of school transportation. Lots of things about schools and families have changed since 1985. School choice did not really exist then. In my Twin Cities suburban district, children were mostly assigned schools based on their address. Some children went to Catholic school and some families probably had other reasons for attending a public school other than their assigned school, but for the most part, you attended the school you were assigned. Now that landscape is very different. Charter schools, which are public schools that are not part of the district, did not exist until 1991. Districts now have magnet schools, which are public schools within a district with a specialized curriculum like language immersion or arts. Private schools still exist and there are still school districts organized like the ones I attended in the 1980s. Now, in urban and large suburban areas, children on the same block are likely to attend all different schools depending on their parents’ choices and values. Another big change is the proportion of mothers who work. According to the U.S. Department of Labor, in 1984, when I started first grade, 47 percent of mothers with children under the age 18 worked in paid employment. Today, 70 percent of mothers work. So, when I was little, children were more likely to have a parent home to see them off to the bus or to meet them when they walked home. Now, before and after school care and school transportation must be figured out in the context of parents' work schedules. Finally, perceptions of safety, stranger danger, and society tolerance for unsupervised children have changed. Whether real or imagined, perceptions of safety impact how parents get their children to school. Examples like this family in Vancouver, Canada, where the father was barred from letting his children ride the city bus to school, abound. When other parents found out my second grader walked a few blocks alone, I received accolades and concern in equal measure. People offered to drive him so we would not have to endanger him. So, while watching the total chaos of cars and harried parents at my children’s school, I became curious about how school choice, school transportation policies, and family circumstances and values impact how children get to school. I talked to five parents with children in different kinds schools, with different aged children, and with different work commitments, as well as a day care provider, to find out more about those intersections and which values they chose to prioritize. Only one parent, Jeff Christenson, has the experience I had growing up. His two daughters attend an elementary school in Saint Paul which was one of the community schools they could choose from. They like the school and, for the most part, it meets his children’s educational needs. Both girls ride the bus to school and it only takes 20 minutes. A parent walks them to the stop in the morning and a babysitter meets them in the afternoon. Other families, however, made a series of trade-offs based on both their needs and values. Beth Jackson has had children in school since 1996. Two of her three children are in their 20s and the youngest is in high school. In the last 20 years, her children attended public magnet schools, charters, and private Catholic schools. Her children walked and took the school bus at times, but for the last 11 years, her children were driven to school by a parent. In addition, she has run a home day care for more than 15 years and shepherded more than 50 families through preschool (public preschool is offered in Saint Paul) and kindergarten entry. Their best transportation situation was when her eldest daughter attended a charter that provided busing and the stop was only three blocks from their house. 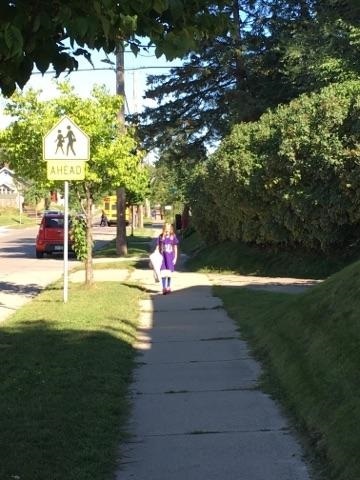 The children also attended a private elementary located four blocks from their house and walked, but the school was not as academically rigorous as they wanted, so that was only for a short while. Now, they mostly drive their youngest daughter to high school. The private school offers a discounted Metro Transit pass, but it requires two transfers and walking half a mile to a bus stop in the dark. “She has to be there at 7:30 a.m. and that’s a long walk in the dark," says Jackson. "She also must carry sports equipment and that’s difficult. So, we drive.” She notes that very few children use the passes and almost all are poor or brown-skinned. “It’s just not socially desirable to take the bus,” she explains. Beth acknowledges her privilege in having a choice. Her family can afford to drive them and has the flexibility to do so, as well as the ability to send them to a private high school. She experiences that interplay between privilege, school choice, and transportation options in other ways through the families in her day care. In 2014, Saint Paul Public Schools changed the way families choose schools and the way transportation is provided. Prior to the change families could attend any school in the district and transportation was provided to that school. After the change, the city is split into Community School Zones (CSZ) and regions. Children can still attend any school, but transportation is only provided to schools within that region for families a certain distance from the school. Applications are prioritized by CSZ and Reflecting St. Paul criteria, which are about mostly related racial/ethnic and socio-economic equity. This is super complicated and plays out for families in complex ways. It does have a concrete impact on child care choices (or lack thereof). Families who chose a day care at least in part because it was close to their home now find they cannot safely get their children to the community school. Beth cannot walk children to school and the parents are not there, so children either must change day cares to be in the CSZ but far enough to receive busing; choose a school that buses from the day care (not the community school); or chose a school that offers Discovery Zone, the after/before school program. Not all schools offer Discovery Zone. Kuan Teoh has made similar choices for his eighth-grade son. They live in an inner ring suburb and his son had attended school in that district, mostly riding the bus, until this year. However, like Beth, he felt that the school was not the best environment for his son. His son is a gifted musician and he wanted more flexibility in the school schedule so his son could spend more time with his music. Now, his son attends school at a neighboring district and Kuan drives him about 30 minutes each way. This results in two hours in the car each day for Kuan. “The trade-off is fantastic,” Kuan says. His son and their family are getting what they need, at the cost of extra time in the car. He notes that the bus ride to the junior high in his district is 50 minutes so the overall commute time is not that different. He also, like Beth, acknowledges the “luxury of being able to be an engaged parent,” realizing that most families do not have this option. To Nikki Nafziger the value her family finds in investing in their community school outweighs concerns that the school does not meet her children’s needs as well as others further away. She and her husband have three children – one in junior high, one in elementary, and a preschooler. The two eldest walk to their Minneapolis community school that is three blocks from their house. “We made a conscious choice to make life sane and simple,” Nafziger says. To keep life sane and simple, they decided her husband should mostly be a stay at home dad, noting that if he worked full-time they would need day care and likely would have to drive. It also means attending their community school and finding ways to make it work for their children. So far, though, it’s a choice that has brought many rewards. She cites a stronger community, deeper relationships with neighbors and children, and great friendships built around the school. The school is the center of their neighborhood and creates a virtuous cycle. Part of the reason her children can walk safely to school is because of the community they built around the school. There are always adults around who know her family and children and look out for each other. Yet, she recognizes that for other parents driving to a particular school is a better choice. “You have to make the best choice for your kids and your family, whatever that is," she says. When Kelly Browne and her husband were deciding where to send their now third-grade son to school, they wanted to continue with the Spanish immersion experience he received in preschool. At the time, they lived in North Minneapolis and the only Spanish immersion offered by Minneapolis Public Schools is in southwest Minneapolis. Realizing the bus ride would be too long and wanting to attend school near their home, they moved to an inner ring suburb that offered the program they wanted. So few children bike or walk to school these days. Although they moved less than two miles from the desired school, things have not gone the way they envisioned and Browne drives her son to school. In kindergarten and first grade her son rode the bus, but the one and half mile distance took 45 minutes. This was a common complaint from parents – short distances often take a very long time. My son’s bus ride in kindergarten was more than an hour each direction and we lived about four miles from the school. Two hours a day is a long time to spend on a bus for a five year old! Browne explains, “Nothing good came from that bus ride. The only time he has gotten into trouble for behavior was on the bus and there was quite a bit of bullying. They are unsupervised and a lot can happen in that hour and half.” Her son was stressed by the experience and began disliking school. She tried to get a flexible schedule at work so she could drop him off, but the 9 a.m. school start time was too late and, ultimately, it did not work for her. She also noted how stressful the drop-offs and pick-ups were because of all the other parents driving. Now, her son attends a before- and after-school child care program. She can drop him off at 8 a.m., work a regular schedule, and pick him up after the end of the day rush. Essentially, she is paying for child care to avoid traffic. We do the same. We bike or walk to school in the morning and have our children in an after-school program, partially due to work schedules, and partially to avoid the rush. Browne feels the distance, although only a mile and half, is too far for her son to bike as an eight-year old, especially since he must navigate several busy intersections. She is hopeful that he will be able to bike himself when he starts sixth grade. He will be at a different school, two miles from their house, but he will be older and the route is safer. What does this mean for policy makers? My point is not to make a prescription for how schools should provide transportation or to say there is a right or wrong decision regarding school transportation. What is best for different families will vary.. As we think about transportation policies, including the built environment around the school and how schools provide transportation, a few thoughts stand out. First, every parent I spoke with was aware of how privilege impacts their ability to make choices. Stay at home parents and parents in good economic circumstances have access to different schools and different transportation options than other parents. Even Nikki’s choice to attend a community school and find other ways to provide enrichment comes down to her family’s ability to provide that enrichment – it’s not just the privilege of having a car and time. What about families whose choices are limited by money, time, or circumstance, like a rigid work schedule? Second, travel times on buses seem ridiculously long and the lack of supervision leads many parents to decide that the bus, even if available, is not a good option. Also (preaching to the choir), our streets are not built in a way that allow children to safely walk to school. A common refrain I heard is, “My children could walk to school, but for that dangerous intersection.” Others noted that the walk is fine, but traffic around the school from parents driving is the dangerous part. If we want fewer families to drive, there needs to be a better way to provide busing and improve safety for walkers. Finally, parenting is personal and driven by values. Each story here reflected some values preference. As policy-makers consider transportation policy, they need to be cognizant of values and the trade-offs families are making.